Well no doubt you see the rain falling outside right now. You don’t need a weatherman to tell you that! But this is a particularly cool and wet storm with a gigantic band of heavy precipitation falling all along the Hood Canal extending as far south as Shelton and as far east as Bremerton. I really hope you planned those outdoor Easter activities yesterday, because there really won’t be a good time today to do them. But then again if you’ve lived in Washington long enough you’ve likely found a way to get those outdoor activities done even if the rain is falling. Skies clear with only a chance of showers for Tuesday before the dry weather takes hold Wednesday and Thursday. 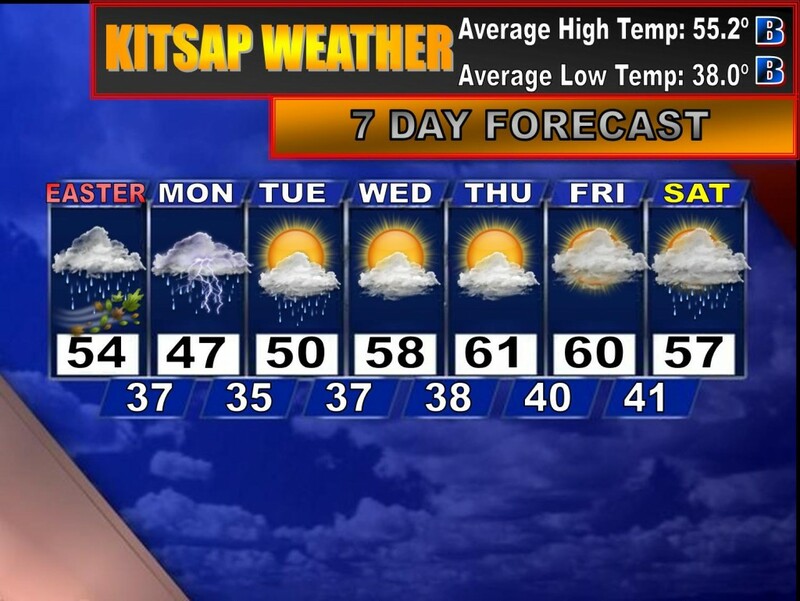 Highs will be close to 60º. Have a fantastic Easter Sunday and try to stay dry!